So what are we going for here? When I think of a mattress, I generally think of it hopefully providing the best sleep "experience" I can have. But here you have a choice between the Reggae Firm and the Mambo Euro Top. 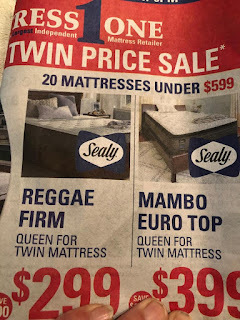 Are you more of a Reggae type of mattress user or a Mambo type? I think I'm too old to Mambo in bed but I can probably still manage a little Reggae swaying. That has nothing to do with anything. It just made me scratch my head and say, "What?" This damn virus that has found its way into my home is driving me insane. Mr. Moon still feels unwell and has a cough. I, too, have had a cough and not a whole lot of energy but suddenly last night I felt descended upon by another layer of the virus. Same symptoms- upper respiratory and cough (no worse than before) but now I appear to be running a fever. When I woke up this morning I hugged my husband to me and said, "Stay home. Stay in bed all day with me." Trust me when I say I was mostly going for the cozy factor, not Mamboing. He considered it but of course he put on his working clothes and I got up and made him oatmeal with raisins and we commiserated about our various symptoms and ills and then he went to work and I actually went to town to the store to get things to make Tom Kha Gai soup which I have a powerful hankering for. And then I went to Joanne's to get a pattern to make Maggie a new dress and the whole time I was in town I was thinking, "What in hell am I doing?" and walked around like I weighed five thousand earth-tons and feeling spacey and weird. So. Do I have a different virus or has the one I had morphed? Other people have reported that this thing has lingered for three weeks or more. We're on week two. Jessie has house guests and she thinks that between all of them, they are experiencing three different viruses at her house. 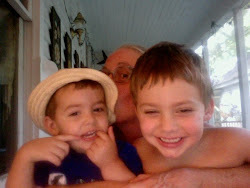 Levon was a miserable boy yesterday, he threw up, he had fever. He just wanted to lay down next to his mommy. I hear he is better today. August had what Boppy had for sure but seems better. Jessie seemed to have what I seemed to have and actually, NONE OF US KNOW WHAT ANY OF US HAVE! Lily's family seems to have escaped the worst (knock wood) although Maggie has had a snotty nose and cough for quite awhile. My own doctor told me that he has had three upper respiratory viruses this winter. I've been back from Mexico for two weeks. I felt better there than I've felt in years and ever since I've gotten back it's been one damn thing after another. So it goes and so it is and there isn't a damn thing to do about it except to hydrate and take the occasional Ibuprofen and some cough syrup before bed. Treat the symptoms while waiting for the body to deal with it. I'm going to make a (hopefully) delicious Tom Ka Gai soup tonight. I'm using a recipe (mostly) from a web site that Lily's sister-in-law (mother of the darling Lenore) runs. She is an amazing vegan cook. If you want to check out the recipe and her site, go HERE. I think I'm going to add some tofu for a little protein. Mr. Moon read an article about how the eating of meat and sugar is destroying our planet and our health and he's all onboard for more vegetarian options. And venison, of course. And fish. I told him that back in the sixties a woman named Frances Moore Lappe wrote a book called "Diet For A Small Planet" and that only the hippies paid attention but here we are. Of course, every good hippie has that book and quite possibly "Recipes For A Small Planet" on their cookbook shelf and I am one of those. I should dig it out for the nostalgia factor if nothing else. What goes around comes around and in the case of this virus, it never seems to want to jump off the merry-go-round of torment. Here I go to grate ginger and slice green onions, thus ensuring that I am doing the best I can to nourish our bodies along with our souls. That soup looks good. I have a similar recipe but it has chicken in it and some red thai curry. Yum. I've never made the soup but love to order it when we go to Thai Town. 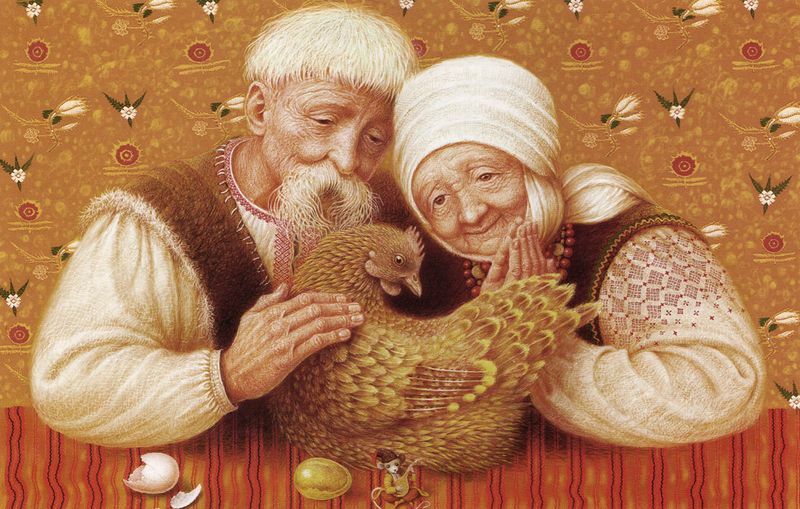 Forgive me if I've said this before, but I highly recommend Elderberry Syrup for the whole family. It's an immune booster and is especially helpful for upper respiratory stuff. The brand we use is called Nature's Way Sambuccus. i read diet for a small planet!!! i hope you feel better soon. the creeping crud is going around both my classes, so far i'm just snotty and hoarse, but we've sent kids home for fever/ vomiting. From your description of the symptoms I would say that you have either contracted The Government Shutdown Virus or The Mexican Wall Virus. Both of them were concocted in a secret laboratory at the top of Trump Tower in New York City by a lunatic with orange hair who worked for The Russians. He has also got tiny hands. ...and he sleeps on a Jarabe Tapatío soft mattress. I used to have that book! And several of the Moosewood cookbooks, too. I didn't bring them with me when I moved overseas and I should have. Oh, ugh! Sorry about the virus! I hope it scuttles away relatively quickly! People are sick here, too (fortunately not me so far, knock wood). It's just January, I guess. 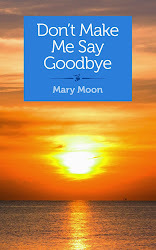 Feel better dear Mary. That soup looks like it could restore some vitality. Rest up. I hope the soup is healing! Viruses just drag on. Lol. 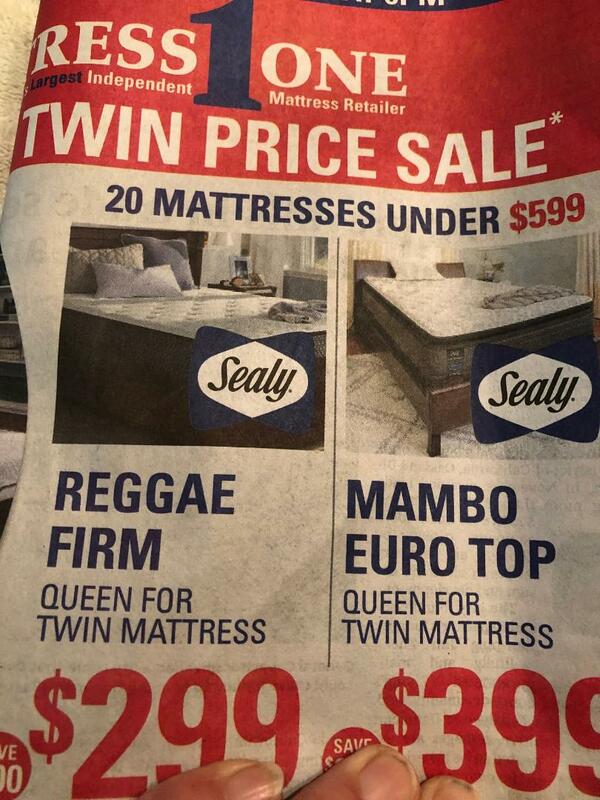 'Reggae' and 'Mambo' don't have the most restful connotations, but *i'm* no marketing expert. Fallen behind in my reading. Was on a Tom Kha Gai soup making kick right about this time. So warm and satisfying in my belly especially up here back in January. Yummm.